Make your kitchen the heart of your home with Dream Doors South West London. Speak to our designers and view our stunning collection at your local kitchen showroom. Speak to our kitchen design team at your local Dream Doors South West London kitchen showroom to plan and create a stunning bespoke kitchen for your home. Based in Streatham, you can find kitchen ideas to suit every taste and speak with our local experts who can help you customise your ideal design. Our South West London showroom, owned by Michael and Julie, serves the South West London area and they will be happy to discuss your requirements and help you create your perfect kitchen. Michael and Julie can show you the wide variety of options available to you including our classic, traditional, modern and contemporary designs. As well as our online kitchen design tool, you can also schedule a consultation with Michael and Julie, who can come to view your existing kitchen space and provide a no obligation quote based on your ideas. This is a practical solution should you need some first-hand expertise and ensures our design team can get to grips with your project quickly and efficiently. 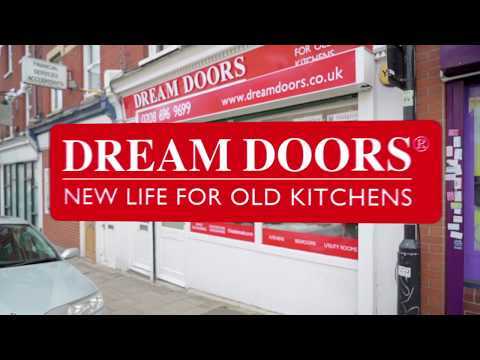 Dream Doors South West London offers kitchen makeovers in all SW postcode areas, including: Balham, Nine Elms, Barnes, Oval, Battersea, Parsons Green, Pimlico, Belgravia, Pollards Hill, Brixton, Putney, Brompton Putney Heath, Putney Vale, Raynes Park, Chelsea, Richmond Park, Clapham Park, Roehampton, Clapham, Clapham South, Sloane Square, Colliers Wood, South Kensington, Earlsfield Southfields, Stockwell, East Sheen, Streatham Common, Streatham Hill, Fulham, Streatham Park, Furzedown, Streatham Vale, Tooting, Knightsbridge, Wandsworth, Wandsworth Common, Merton Abbey, Merton Park, Mitcham Wimbledon Common, Mitcham Common, Wimbledon, Morden, Wimbledon Chase, Mortlake and all local South West London UK postcode areas including SW1A, SW1E, SW1H, SW1P, SW1V, SW1W, SW1X, SW1Y, SW2, SW3, SW4, SW5, SW6, SW7, SW8, SW9, SW10, SW11, SW12, SW13, SW14, SW15, SW16, SW17, SW18, SW19, SW20. "FANTASTIC!!!! Found the business in the internet and was very pleasantly surprised of the courtesy and efficiency from start to finish. VERY HIGHLY RECOMMENDED." "Very professional and courteous. Quality of work and finish was excellent and very accommodating in terms of additional asks." "Courteous, professional service at a reasonable price. Very happy with the service." "A good job - excellent customer service. Fast and efficient fitting, pleased with the result"